forward to speaking with you about your upcoming event and how we can add to the fun. Give us a call or request more info today. Send us a message using the form below. We’ll get back to you quickly. Type of Event (what's happening?!) Birthday Party Kids Party Grown-ups Only Community Event School Dance/Prom Wedding/Reception Anniversary Sports or Tailgate Other Private Celebration Corporate Event/Tradeshow I'm Not Sure Yet! Can't Tell You Now. Just Send Info. Annnd… Action! 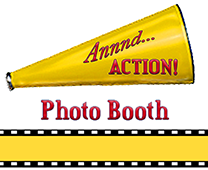 Photo Booth is a privately-owned small business located in the Los Angeles area. Please contact us today with questions + to book your Photo Booth experience.